I'd be lying if I said that I wasn't hoping, unrealistic though it may be, that the FBI trailer for Ubisoft's upcoming Rainbow Six Siege would feature Mulder and Scully pondering the holes in the wall and the far-fetched origins of those who left them behind, while Skinner scowled in the background, fretting over his career. Alas, this is FBI SWAT, and they are less about the investigating part of the job, and more about the bit where they shoot everything that moves. The previous trailer for the British SAS made note of the specific sorts of shenanigans at which that team excels: rappel, aerial, gas, and light armor. The FBI doesn't get the same sort of treatment, but the trailer does introduce us to the special skills that each of the team's four members brings to the table. Ash packs a grenade launcher that's good at blowing big holes in small things; Pulse has a tracker that detects enemy heartbeats; Castle lugs around the bulletproof panel that's handy for securing doorways; and Thermite uses some kind of hot-burning chemical compound to create breaches in walls. 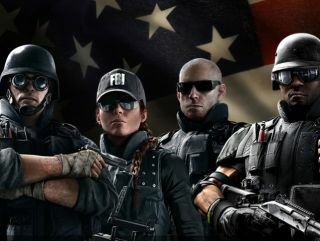 On the surface, the FBI team looks more or less the same as the SAS—guns, grenades, sensors, and barricades—but the more detailed character breakdowns on the Rainbow Six Siege "Operator Spotlight" page indicate that there will be some degree of rock-paper-scissors strategy to character selection. Ash's grenade launcher, for instance, enables her to breach walls and doors without being hampered by Mute, who carries a signal jammer that can disable remotely-detonated devices. With the FBI done, only GSG-9, GIGN, and the Spetsnaz remain. I'm thinking that last one should be especially good. Rainbow Six Siege comes out on October 13.